DUARTE, CA (BRAIN)—Dahon has issued a voluntary recall of the seatpost bolt on full-size 2007 models. The seatpost bolt can break under use and may pose a potential safety hazard. The bolt should be replaced immediately. WASHINGTON, D.C. (BRAIN)—The U.S. Consumer Product Safety Commission, in cooperation with Specialized, yesterday announced a voluntary recall of some of the company's bicycle helmets. Roughly 3,000 helmets were made. 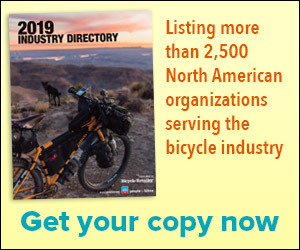 WASHINGTON, D.C. (BRAIN) — Bike manufacturers could feel the backlash from a recent spate of recalls that have raised a cry for stricter product regulation from federal legislators. WASHINGTON D.C. (BRAIN)—The U.S. Consumer Product Safety Commission, in cooperation with Reynolds, yesterday announced a voluntary recall of Reynolds UL forks. Roughly 330 of these forks were sold. Roughly 22,000 of these bicycles were sold. WASHINGTON, D.C. (BRAIN)—The U.S. Consumer Product Safety Commission, in cooperation with Formula Brake USA, yesterday announced a voluntary recall on its Oro Disc Brakes. Roughly 5,700 of these brakes were sold. CERRITOS, CA (BRAIN)—Razor USA and the CPSC (Consumer Product Safety Commission) are recalling approximately 20,000 Razor E300 electric scooters because a weld can break causing the handlebar to detach. SUMNER, WA (BRAIN)-REI is recalling about 5,200 Novara Afterburner Trailer bicycles. The outdoor retailer chain said the children's trailer bicycle can detach from the adult bicycle, posing a fall hazard to children. KENT, WA (BRAIN)—The U.S. Consumer Product Safety Commission along with Raleigh America recently announced a voluntary recall of several bicycles. TUSCON, AZ (BRAIN)—Genuine Innovations has issued a voluntary recall on its Second Wind MTB and Wrench Force Two Shot inflators. SEYMOUR, CT (BRAIN)—Thule has issued a recall on a number of its discontinued hitch-style bicycle racks.